Hola Amigas. How is everyone doing? Have you been playing with your NEW Occassions Mini Goodies or your NEW Sale-A-Bration goodies? If not call me to schedule your workshop or class TODAY! 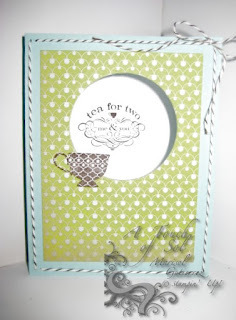 Today I am going to share with you a card I created using the Tea Shoppe Stamp Set. It is really pretty. 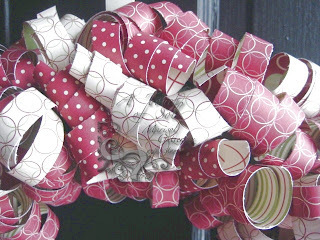 Great for tea parties, shower invites, etc. This is also for the SUDSOL Case Challenge 124. I love the simplicity of this card. I pierced two holes in each corner to thread the Baker's Twine. What do you think? The DSP I used is from the SAB mini. You can get it FREE with a $50.00 purchase. We all LOVE FREE! Hello Amigas! Today was a little colder than yesterday but of course that didn't stop Joaquin and I from enjoying the day. We went to the library and took out some new books. One of the books we borrowed is Go To Bed, Monster. Lucy can't sleep so she decides to make shapes on her page and it turns out she drew a monster. Well Joaquin and I did the same. She speaks of oval body, square head, rectangle legs triangles on his back. I gave Joaquin the same instruction and he did well. It also helped reinforce his shapes. We also found an Amelia Bedelia's First Day of School. Funny to read about her when she was younger and literal-minded. Both Solimar and Joaquin love reading Amelia Bedelia. Here is a Nugget Tin I made for Valentine's Day. This holiday doesn't have to be expensive. 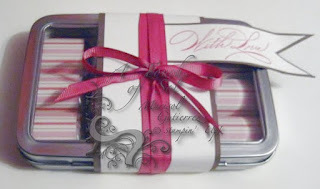 By simply wrapping Hershey nuggets with DSP and adding a band and sentiment, you have a PERFECT Gift! At least, I think so! Hola Amigas! It was such a BEAUTIFUL day today! Where did the month of January go? 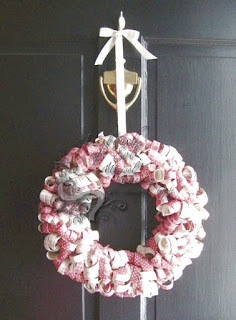 Today I want to share with you my project and an AMAZING promo that Stampin' UP! is currently having. Okay to my project first. I made a curly wreath. Isn't it CUTE? I made it using retired Designer Series Paper (DSP). LOVE IT! Here is a close up of the curliques.